Teachers in Scotland are moving closer to a strike after pay talks broke down earlier today. 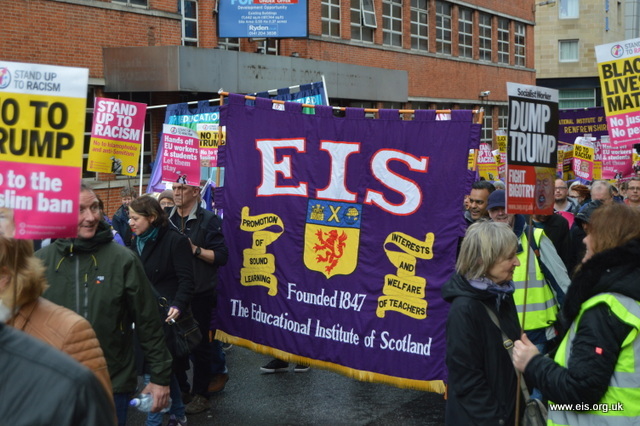 The EIS has accused the Scottish government of abandoning the talks rather than seek to negotiate a solution after they and local authorities refused to consider improvements to their previous offer, already rejected by EIS negotiators as “derisory” and “divisive”. A recent OECD report revealed that Scotland was one of only five OECD countries where teachers’ pay had fallen, relative to comparable professional salaries, over the past decade. The union claimed that this was a result of conscious political decisions which undervalued education and undervalued teachers. The EIS Salaries Committee, which has already unanimously rejected the offer, will hold an emergency meeting next week to determine the terms of consultative ballot of EIS members. EIS general secretary Larry Flanagan said: “It is shameful that Scottish ministers have walked away from the negotiating table in this manner. The EIS, and other unions, had offered constructive proposals for government and COSLA to consider but in rejecting them out of hand, Ministers have effectively dismissed the concerns of Scottish teachers. “In a week when a letter from a Primary teacher has revealed the low state of morale amongst Scottish teachers, the Deputy First Minister has shown that he isn’t listening. Teachers will be disappointed and angry.